One of the most rewarding parts of nature photography is learning how to identify your subjects. When we place a name on something, it somehow makes us feel more connected to it. When you first meet someone new, the first thing you tell them is your name. And, so naturally, when we photograph something we haven’t seen before, we immediately want to know what it is. But, it’s not always easy to identify your subjects. Sure, you probably know all the common birds and insects of your area, but what if you’re hiking down a trail and see this amazing looking butterfly for the first time? Sometimes all that separates one species from another is a little dot on their back somewhere. And, these key features that help identify your subject are not always visible in the most artistic pose of your subject. So, when you stumble upon a new subject, take that artistic shot first, but then get some photos from different angles to help you identify your subject later. You won’t always have time to take these “ID photos” (especially if it’s a bird), but always make the effort if you can. 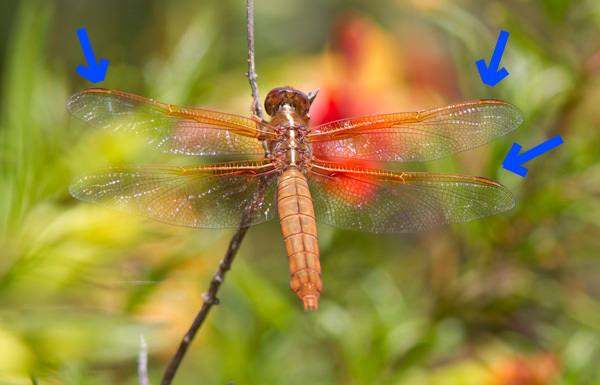 This one isn’t very artistic or anything, but it was extremely helpful in identifying the dragonfly because it shows those darker spots on the dragonfly’s wings (see blue arrows). Lots of different dragonflies look similar from the side, so the only way to differentiate some of them is by their wings. 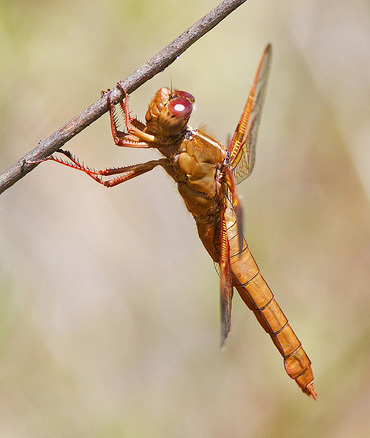 By the way, the dragonfly in the photos above is a female Flame Skimmer (Libellula saturata). I always see lots of males in the summer, but this was the first time I saw a female. If you enjoyed this article, and would like to read more, please signup for free updates by email or RSS. About the Author: Steve Berardi is a naturalist, photographer, computer scientist, and founder of PhotoNaturalist. You can usually find him hiking in the beautiful mountains and deserts of Southern California. Steve, I don’t know a thing about butterflies, but I believe a person can’t go wrong with your theory/procedure. I use it daily in my sign survey world of taking pictures to show someone of an exceptional sign, all the angles makes for a good understanding and teaching challenges of what is out there in the real world. Thanks for your input, well taken, I will apply your article to my “Tree shots” as non-naturalists views trees are for shade only, and not for their beauty. When in doubt, and when possible, it’s usually helpful to get clear pics of antennae, the wing veins, the feet (all three pairs if you can) and any prominent bristles. A wider habitat shot can also be useful, or at least good notes–deciduous vs conifer habitat; sandy soils/’normal’/boggy/rock; wooded/shrubby/grassy. Then post to bugguide.net, where many helpful entomologists hang out, and will be happy to have details to work with! @William – Glad you enjoyed the post! @Pholcid – Thanks for sharing that site, bugguide.net. Great find! And, great point about photographing the surrounding habitat too–that can certainly help you identify a subject too. I was going to suggest bugguide.net as well. That is a tremendous resource that can sometimes result in a response within minutes. Nice post. I would also recommend making sure to take a full body shot. This definitely applies to dragonflies as sometimes gender or species determination can depend on the shape of the end of the abdomen. Sometimes people only seem to have that great close up of the head region, or they crop off the tip of the abdomen. Another great post Steve! Your thoughts are very well simplified.